Alle SCMYK-Ohrringe werden von unserem tollen Team per Hand her- oder fertiggestellt, mit ganz viel Liebe und Sorgfalt. Die hochwertigsten und immer topaktuellen Ohrringe! 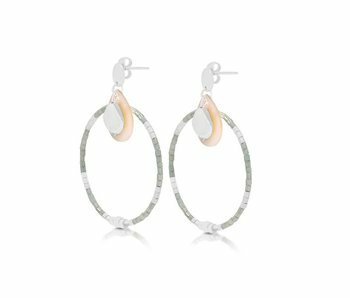 Silver plated earrings with a ring of orange and silver beads, a mother-of-pearl droplet and silver plated scallop seashell. Length is 5,5 cm. Diameter hoop is 40 mm. 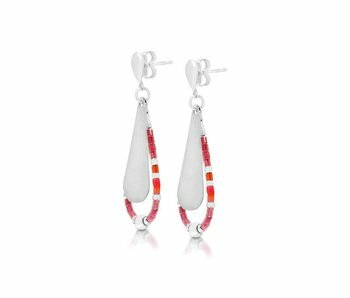 Silver plated earrings with a drop of orange, pink and silver beads and a silver plated drop. Length is 4 cm. Length drop is 3 cm. 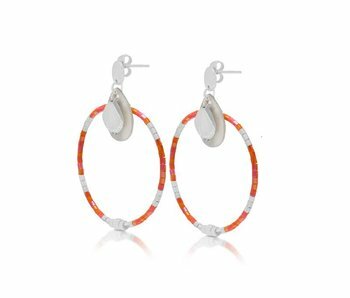 Silver plated hoop earrings partly wrapped in bright orange, pink & silver thread. Diameter is 35 mm. 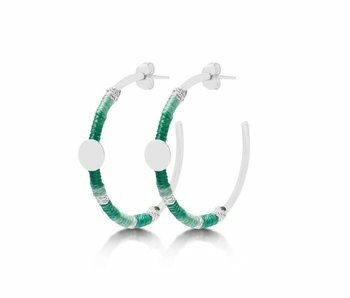 Silver plated earrings with a ring of mintgreen and silver beads, a mother-of-pearl droplet and silver plated scallop seashell. Length is 5,5 cm. Diameter hoop is 40 mm. Silver plated earrings with a drop of mintgreen and silver beads and a silver plated drop. Length is 4 cm. Length drop is 3 cm. Silver plated hoop earrings partly wrapped in turquoise & silver thread. Diameter is 35 mm. 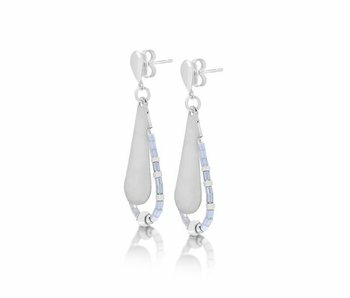 Silver plated earrings with a ring of grey and silver beads, a mother-of-pearl droplet and silver plated scallop seashell. Length is 5,5 cm. Diameter hoop is 40 mm. 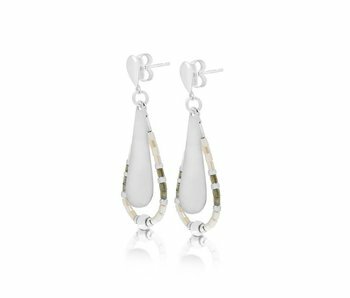 Silver plated earrings with a drop of grey and silver beads and a silver plated drop. Length is 4 cm. Length drop is 3 cm. Silver plated hoop earrings partly wrapped in grey, white & silver thread. Diameter is 35 mm. 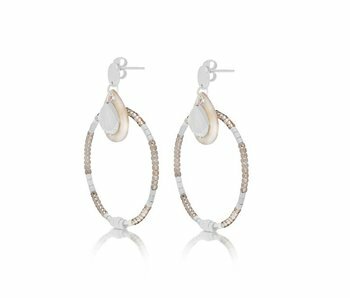 Silver plated earrings with a ring of off-white and silver beads, a mother-of-pearl droplet and silver plated scallop seashell. Length is 5,5 cm. Diameter hoop is 40 mm. 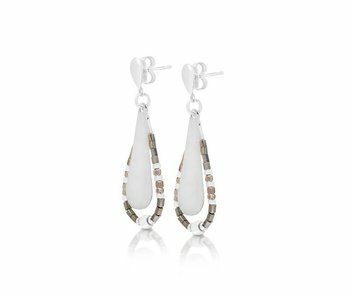 Silver plated earrings with a drop of off-white, brown and silver beads and a silver plated drop. Length is 4 cm. Length drop is 3 cm. Silver plated hoop earrings partly wrapped in off-white, light brown & silver thread. Diameter is 35 mm. 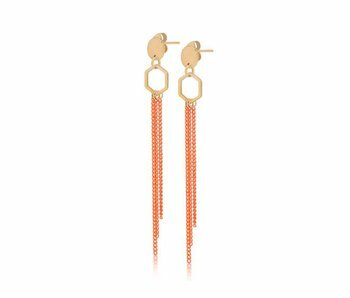 Gold plated earrings with hexagon charm and orange chain detail. Length is 7,5 cm. 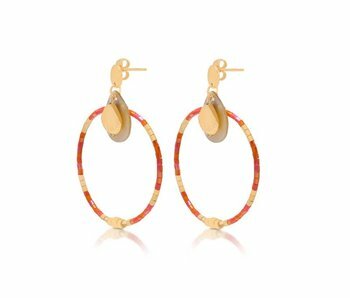 Gold plated earrings with a ring of orange and gold beads, a mother-of-pearl droplet and gold plated scallop seashell. Length is 5,5 cm. Diameter hoop is 40 mm. 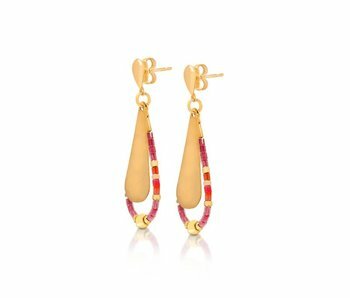 Gold plated earrings with a drop of orange, pink and gold beads and a gold plated drop. Length is 4 cm. Length drop is 3 cm. Gold plated hoop earrings partly wrapped in bright orange, pink & gold thread. Diameter is 35 mm. 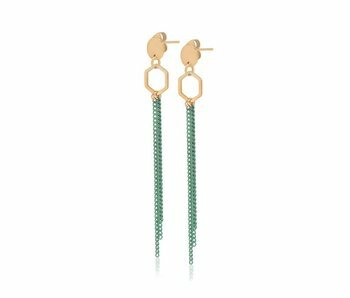 Gold plated earrings with hexagon charm and turquoise chain detail. Length is 7,5 cm. Gold plated earrings with a ring of mintgreen and gold beads, a mother-of-pearl droplet and gold plated scallop seashell. Length is 5,5 cm. Diameter hoop is 40 mm. 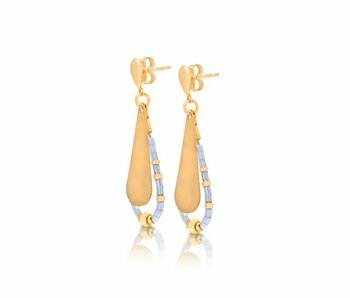 Gold plated earrings with a drop of mintgreen and gold beads and a gold plated drop. Length is 4 cm. Length drop is 3 cm. 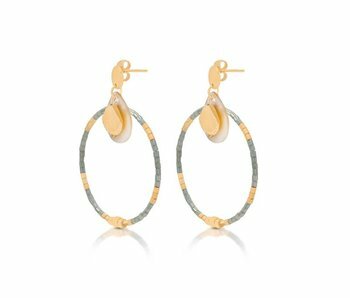 Gold plated hoop earrings partly wrapped in turquoise & gold thread. Diameter is 35 mm. 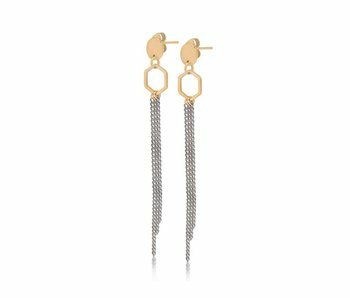 Gold plated earrings with hexagon charm and grey chain detail. Length is 7,5 cm. 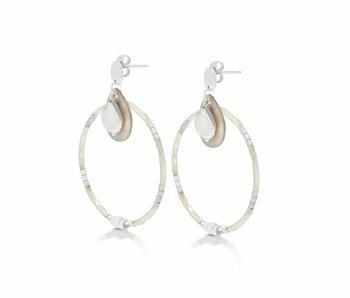 Gold plated earrings with a ring of grey and gold beads, a mother-of-pearl droplet and gold plated scallop seashell. Length is 5,5 cm. Diameter hoop is 40 mm. 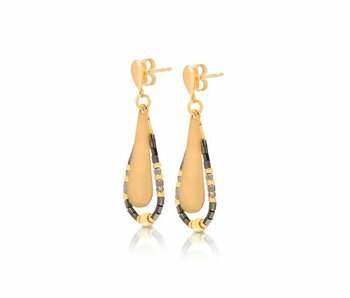 Gold plated earrings with a drop of grey and gold beads and a gold plated drop. Length is 4 cm. Length drop is 3 cm. Gold plated hoop earrings partly wrapped in grey, white & golden thread. Diameter is 35 mm. Das in unserer Fine Jewelry Kollektion verwendete Silber ist 925er Silber, alle Produkte werden auf Bali, Indonesien, von Hand hergestellt. Mit Gold- oder Rotgoldauflagen kombinierte Silberelemente werden einer hochwertigen Beschichtungsbehandlung mit Nano-Finish unterzogen, damit die Farbe erhalten bleibt. Wir bringen mit unseren Schmuckstücken die ganze Schönheit Balis zum Ausdruck. 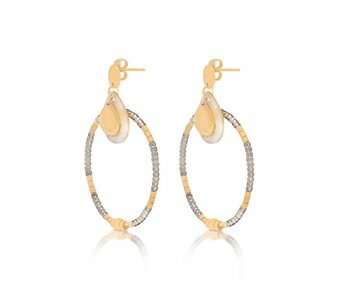 Die Farbpaletten in unserer Fancy Jewelry Kollektion und die 'avantgardistischere' Seite von SCMYK Accessories in der Fine Jewelry Kollektion mit den reineren und minimalistischen Designs. Auf der Insel arbeiten wir mit einem unglaublichen Team aus lokalen Produzenten und Lieferanten zusammen. Bali ist eine wunderschöne Insel, wo man noch 'Handwerk' in seiner reinsten Form findet. So geben wir einer Gemeinschaft, die uns so viel Liebe und Glück gebracht hat (und noch immer bringt), etwas zurück.